Most education in India’s small villages takes place in a local government primary school where children typically between the ages of five and ten attend classes from 1st to 5th standard. There is one primary school in every village and in many of them there is just one teacher who has to teach the entire group of children of different ages at the same time. With today’s education system, where standardised curriculums and centralised examinations are definitive, such a setup puts rural children at a great disadvantage. There are many constraints in villages that make it extremely difficult for the situation to improve. For example, there is a clear lack of teachers, as well as the unclear relationship between formal education and day-to-day village life. The Central Government has launched several far-reaching programmes to address the shortcomings of the Indian education system, including the Right-To- Education (RTE) Act of 2009, which has taken up the goal of delivering elementary education (1st to 8th standard) to all children between six and fourteen years of age. Over the last decade, the government has proactively addressed issues of infrastructure, qualified teachers and enrolment, which lead to significant improvements in the education levels of the rural poor. However, at least as important as enrolment is the continuation of studies. According to the official government statistics of 2016 (U-DISE Report), nationally 29% of children drop out before completing their elementary education (1st to 8th standard), at which point they would be considered literate. For Scheduled Tribes, the same rate is as high as 50%. This is an area of serious concern. While the systemic reforms underway will take a long time to trickle down to the villages, there are several areas where immediate support can be offered to support the government’s initiatives. Amrita SeRVe carries out a range of different activities to promote education, support the children in their studies, as well as supplement academic learning with value education. One of the first steps in each new village is to identify a tuition teacher who can conduct daily tuition classes for the local children. The aim of these Amrita Education Centers is not to replace formal education, but rather to supplement the government education already received by the children in 1st to 8th standard. Amrita Vishwa Vidyapeetham’s Amrita-CREATE manages the tuition centres by providing the teachers with a curriculum, extensive training and materials. A tablet containing CREATE’s own learning resource platform named RITE – Rural India Tablet enhanced Education, is provided to each teacher and used in the classroom for multimedia demonstrations and adult-literacy classes. The children also learn with this platform through educational games and apps. The work done by the M.A. Math and CREATE in the field of tribal education also resulted in the Ministry of Tribal Affairs, Government of India, awarding Amrita Vishwa Vidyapeetham with the status of ‘Centre of Excellence in Tribal Education’ in 2018. In April 2017, the Amrita SeRVe Swastha Kanya Saakshar Kanya, “Healthy Girl, Educated Girl,” campaign was initiated in support of the government’s Beti Bachao, Beti Bathao, “Save the Girl, Educate the Girl” initiative. The government’s programme is aimed at ensuring education and participation of girls, as well as improving the efficiency of welfare services intended for girls. The Amrita SeRVe Swastha Kanya Saakshar Kanya programme seeks to support these national efforts by bringing about awareness in rural India on the issues affecting young girls and uniting people in the villages to provide girls with complete education and appropriate healthcare. Every month, parent-teacher meetings are organised to emphasise the importance of parents supporting their children in their studies. This includes sending the children to school and the tuition centre, as well as preparing for a continuation of studies after primary school. The meetings are typically held at the primary school in the presence of the teacher, but can sometimes also happen more informally. Our priority is to have monthly follow-up with the parents and their children. Preventing school dropouts is one of the most important and challenging tasks in the area of education. After the completion of primary school (4th or 5th standard depending on the state), most children will be required to enrol in a middle school that is often a few kilometres from their small village. Although admission fees are low and government fee waivers are available, paperwork, deadlines and distance pose significant obstacles to both children and parents. Amrita SeRVe not only encourages continuation of studies, but also facilitates the process. Throughout the year, coordinators are vigilant in reaching out to dropouts and helping them reintegrate into the education system. There can be different reasons for dropping out. Some children are simply not interested in studying. They skip school to go playing instead. In these cases, the children usually do not receive sufficient encouragement to pursue their studies from their parents and relatives at home. In other cases, some children are helping their parents in the field or with household chores. Once identified, our staff will talk to parents and teachers, help file necessary paperwork and guide them along in the re-enrolment process. In several cases, the coordinators and tuition teachers will conduct special classes for dropouts to help them enter the new class. 29% of the rural population in India is illiterate according to the latest National Sample Survey (NSS) from 2014. 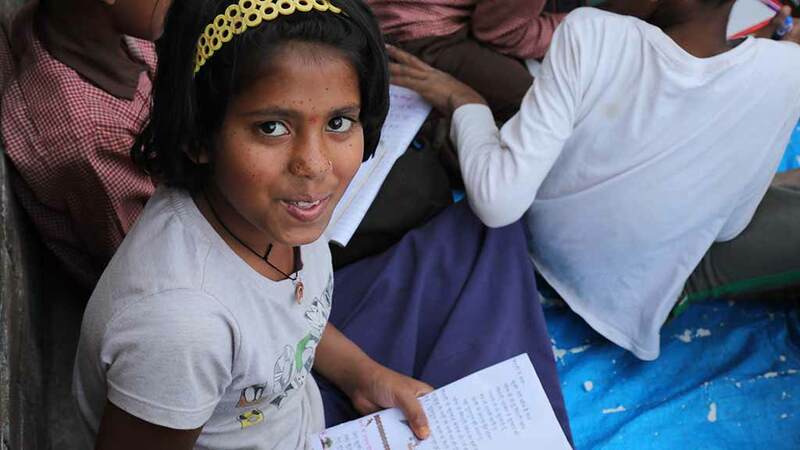 In Amrita SeRVe villages, that leaves about one third of the population without having completed the 8th standard, which is recognised as the qualification for an elementary education. It is important to note the vast differences in education standards from village to village. As such, there are some places, especially tribal settlements, where the rate of illiteracy can even exceed 50%. To address these deficits, several different approaches have been tested to try and organise adult-literacy education. In some places, Amrita SeRVe staff, the village coordinators, health workers and tuition teachers have been teaching smaller groups of adults basic reading and writing skills. Even being able to read a bus sign or a notice board is a great step of empowerment for previously completely illiterate adults. Not being able to read or write has an enormous negative impact on life. Besides severely limiting the variety of jobs that can be taken up, commonly confining illiterates to low-paid manual labour, it also acts as a barrier between government services and the community. Amrita SeRVe has witnessed many cases where illiterate villagers were reluctant to visit the nearby Primary Health Centre (PHC) for free medical services or were unable to apply for health insurance, social security and pensions. Simultaneously, we are promoting an Each-One-Teach-One approach. As our own surveys show, there is a mixture of literates and illiterates in all the villages. Consequently, our coordinators have identified not only illiterates willing to learn, but also literates willing to teach. This empowers the villagers to take matters into their own hands, thereby being empowered, as well as to share and spreading the valuable message of the importance of education.